SANTA CLARA, Calif., June 11, 2018 /PRNewswire/ -- The wait is over for guests who are ready to ride the groundbreaking new single rail steel coaster, RailBlazer, at California's Great America. Opening to the public on Thursday, June 14, the much-anticipated coaster is the first of its kind on the West Coast, featuring a single rail track. 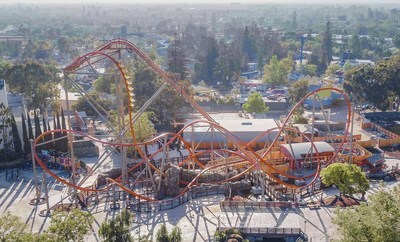 Riders enjoy RailBlazer, the groundbreaking new single rail steel coaster at California’s Great America in Santa Clara. "We know our guests can't wait to ride RailBlazer, a truly revolutionary roller coaster concept," said Raul Rehnborg, vice president and general manager, California's Great America. 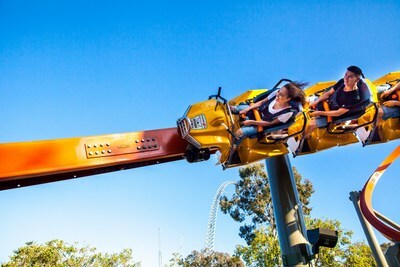 "This intense and exhilarating attraction kicks off a multi-year transformation of California's Great America, following the City of Santa Clara's approval of the park's new master plan. This world-class attraction will be the first of many exciting and new developments guests will experience in the years to come." California's Great America is a 100-acre theme and water park located in Santa Clara, Calif. As Northern California's premier amusement park, featuring thrill rides, live entertainment, and the Boomerang Bay water park, California's Great America is the top destination for thrill-seekers and families alike. California's Great America is owned and operated by Cedar Fair Entertainment Company (NYSE: FUN), a publicly traded partnership and one of the largest regional amusement-resort operators in the world. The Company owns and operates 11 amusement parks, two outdoor water parks, one indoor water park and four hotels. For more information, see www.cedarfair.com.